Before you give up your ferret AND before you call me to take it, please read to the end of the this page. Lady's heart belongs to "O"
Many early cultures referred to themselves and to the animals in their world as "The People". It was an indication of their respect for all life. In Dragon lore, a Weyr is a place of safety and refuge, a home. We try to incorporate both of these concepts into the FurPeopleWeyr. We are a Non-Profit hospice/rehab shelter for Ferrets and are now covered by federal 501(c)(3), charitable status. Donations are tax deductible and all proceeds go directly to the care and maintance of the Ferrets..........food, cages, and the biggest expense - vet bills. There are no "middle men" and no paid employees, just Ferrets in need. We no longer have any ferrets living with us and due to a deadly virus can not take any in. This website is staying up for your information to help you with your little friend. Special People with special needs is what we do. So it saddens me to say because there are so many of these needy souls with so few places to go, so few vets knowledgeable enough to properly diagnose and treat them, as well as train owners in their care, that there are always more People needing our help than we have room for. Currently we are battling a contagious, mutated virus for which there is no cure and no vaccine leaving us no responsible, ethical option but to close to intakes. The illness is just too much of a health risk to knowingly expose any of the People not already endangered. However if you have a specials needs ferret, we will be glad to help you understand how to follow your vets instructions. We will show you what you need to do and how to do it, what questions to ask, all at your home for no charge. We can provide you with vet recommendations. If you feel you have absolutely no way to keep your ferret, contact us. Many times we can help you find discounted foods, vet services, cages, litter and other supplies. In short, we will do whatever we can to help you help your ferret, short of being able to take them in. If you are looking for a ferret we often have a list of ferrets, still with owners needing to place them, who are available and will gladly refer you to a ferret needing a home. If you have decided, for what ever reason, you can no longer care for that trusting soul, despite everything we can both do, please keep a few things in mind. 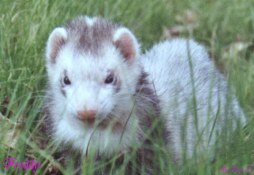 Ferrets more than 3 yrs old are already what vets consider 'geriatric' and are extremely difficult to find homes for. Being uprooted from a familiar environment can be difficult on them physically and emotionally which makes matching them with homes even harder. The older they are, the greater the chance for illness, hidden or other wise, and sick ferrets are virtually impossible to place even if they survive the trauma. Young, healthy ferrets, complete with vaccination records, on the other hand are easier to place. Be wary of placing 'free to a good home ads'. A good home is not in a snake's belly or a dog fight ring. 'Free' can make any pet attractive 'bait'. When purchasing, be very, VERY wary of ferrets on that local internet list. People, 2 legged and 4, are not always what they appear to be. We will do what we can to help both of you. Don't hesitate to email, or call. And please, remember, we do save Ferrets.... We are struggling to treat and care for the People who are here, vet bills, food, litter and medicines are a constant. Don't forget we donate free assistance to others, but at a cost to us. You CAN help. Cash donations can be sent to Park Animal Hospital, Client # 086, 8400 S. Eastern, LV, NV, 89123. Supplies, food, bedding, etc., can be picked up or dropped off in the Las Vegas area, by contacting us to make the necessary arrangements. We have a multitude of cages, carriers, even dog crates and cat carriers, available at very reasonable prices. You can donate time. We are always looking for volunteers who are ferret knowledgeable, or willing to learn, to 'ferret sit' during special events, usually in the PetsMart at Russell/Eastern. You could help some one else understand the intricacies of life with ferrets and improve or even save that ferret's life! Or you can help with fund raisers like posting, maintaining ads, and over seeing the sales of the items we have available. Every little bit helps.